The accompanying diagram shows the stages in meditation that we have outlined from simple awareness of the abdominal movement and progressing to the open awareness of fully developed mindfulness meditation. In the first stage, there is a simple focus on the abdominal movement. 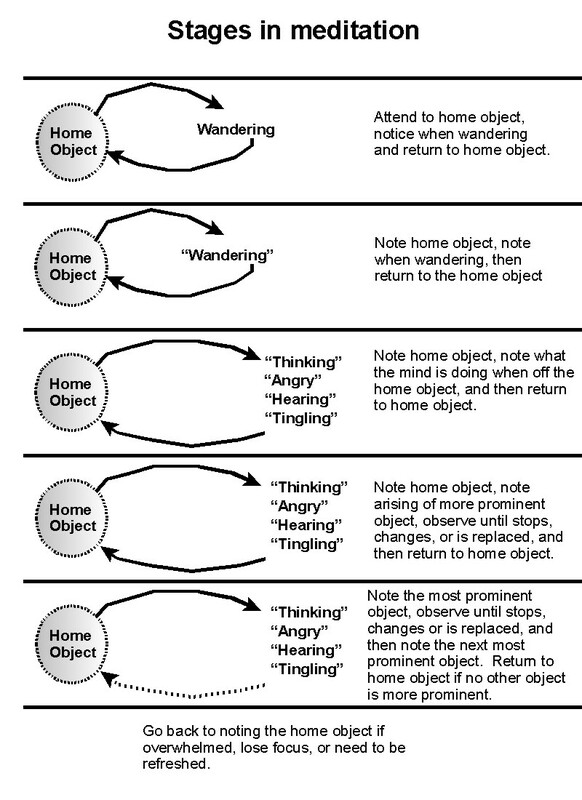 Attention is focused on the home object and when wandering occurs, attention is brought back to the home object. In the next stage, simple noting is introduced, so that “rising” and “falling” are noted along with “wandering” when attention strays. In the third stage, attention is paid to what the mind is doing when it wanders and that is noted. If thinking is present, then “thinking” is noted; if anger is present, “anger” or “angry” is noted. If the mind is attending to sound, then “hearing” is noted. If a tingling sensation is felt, then “tingling” is noted. Then attention is redirected to the home object. In the fourth stage, attention is paid to the predominant object and noted until the object is released, is no longer present, or is displaced by another object. In the next stage, attention shifts from one predominant object to another, only returning to the home object if no other object is more prominent. At any stage, attention can be redirected back to the home object if you are overwhelmed, you lose focus, or you simply need a respite. Choiceless awareness occurs when the shift from one object to another is done effortlessly. These stages are progressive, but in any given meditation session you may go back and forth between the very first stages and the most advanced stages. You should observe your meditation and see what stages you go through.